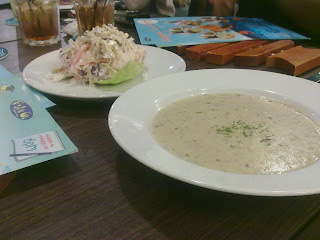 Last Friday, I joined few other bloggers at a Fish and Co Tasting Event at NEX right after my sit-in for one of my senior’s instrumentation lesson. I rushed to NEX immediately after my sit-in and ended up late; I’m really felt apologetic towards you all. : ( Well, let’s get started! 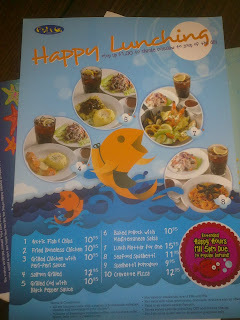 Firstly, presenting the Happy Lunching Menu! Every Happy Lunching Meal even comes with a starter(homemade coleslaw), desert and beverage of your choice. Sounds great right? 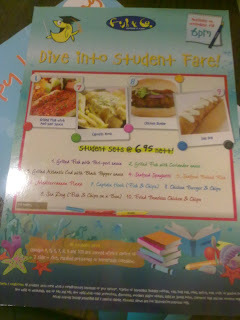 All these stated on the menu only available on weekdays till 5pm. Well, here’s the Student Fare Menu. On top of the main course, you’ll get to choose a beverage of your own choice- coffee, tea, Iced Tea, Coke, Sprite, etc. 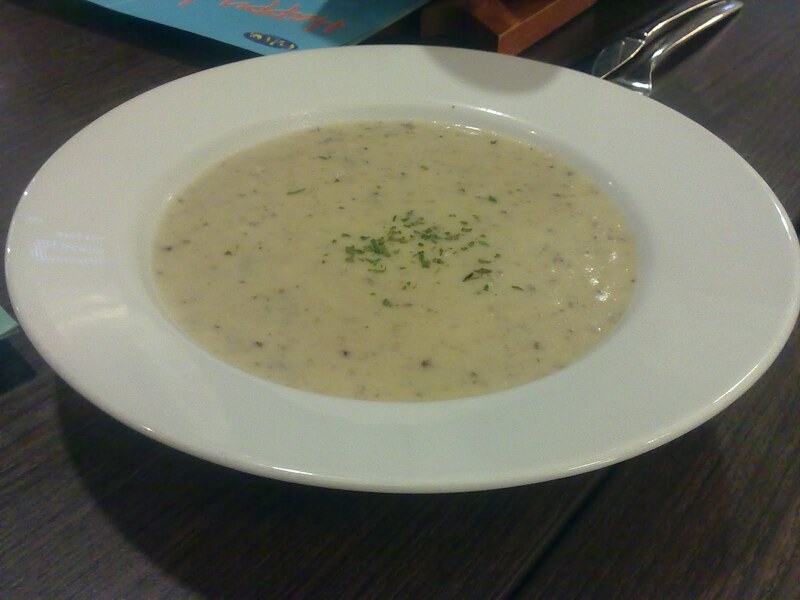 If I am not wrong, they used grinded Fresh Mushroom as well as bits of grinded garlic in the soup. It was really not that type of taste you’ll get in Campbell’s Mushroom Soup; the soup is bit thick and less creamy due to the grinded mushroom in the soup. Well, if you’re looking for a unique taste for Mushroom Soup, I guess this is in for you. It is bit different from the norm you get to see in fast-food restaurants. Look closely and you’ll spot bits of red cabbage mixed with the Coleslaw itself. This is the signature dish for Fish and Co, Fish and Chips. 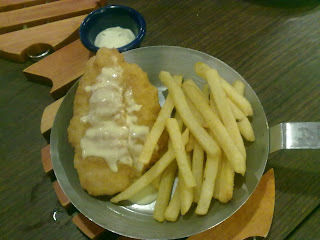 They have used Dory Fillet in the dish- saves trouble for students who are in a rush to finish their meal. Surely you don’t want the waitress to have a tough job after your meal though. I think the taste of the fillet would be better if there’s a slice of fresh lemon to be sprinkled on the top. Alternatively, my first attempt with lemon butter sauce works well with the fillet too! 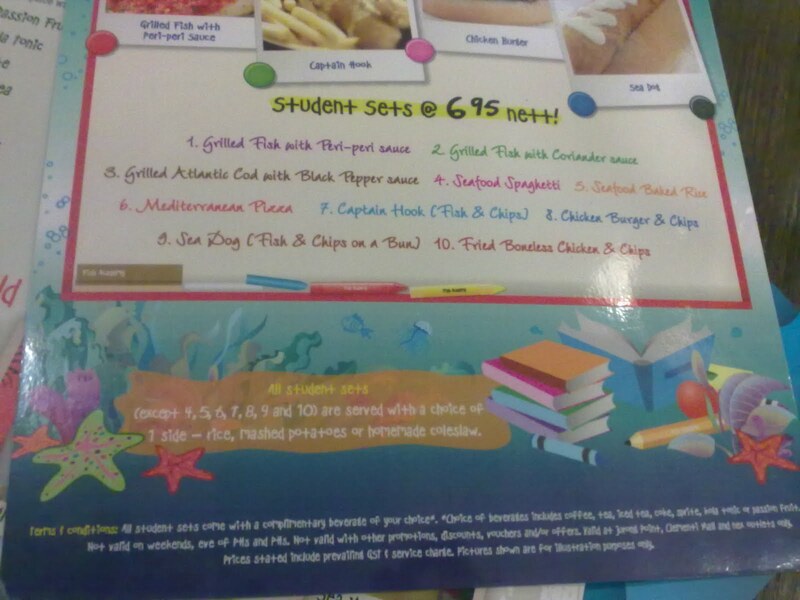 Hmm, most diners would never have thought of Fish and Co having Chicken as part of their menu, including myself. Well, there’s the first chicken dish I’ve tried in Fish and Co. 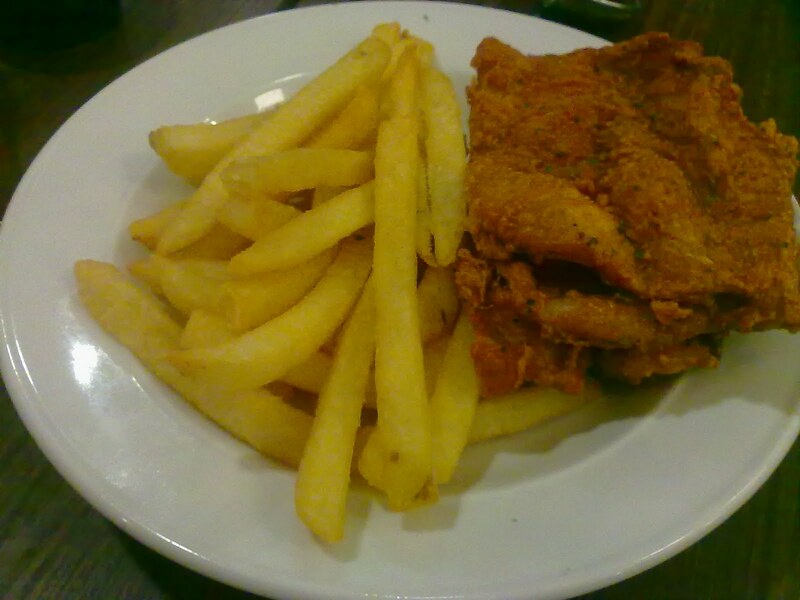 I must say that the chicken is bit tough as it was really hard for us to tear them apart. The serving was really huge for one. 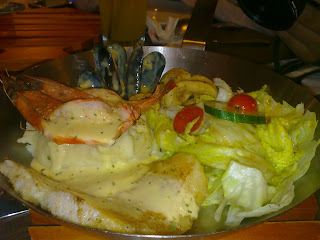 Yes, this is a seafood platter- with prawns, clams and a piece of fish fillet along with a salad on the other side of the pan. 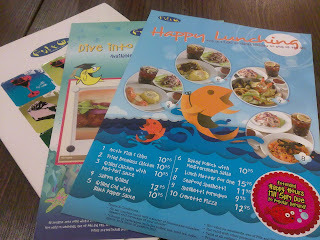 Well, I must say that this is a must-try (although I’m not a seafood fan) as there’s a variety of seafood which you can have a bite and the price is worth it too. For me, I’ll usually share the platter with my friends/buddy as everyone on the table gets a variety of food to try. 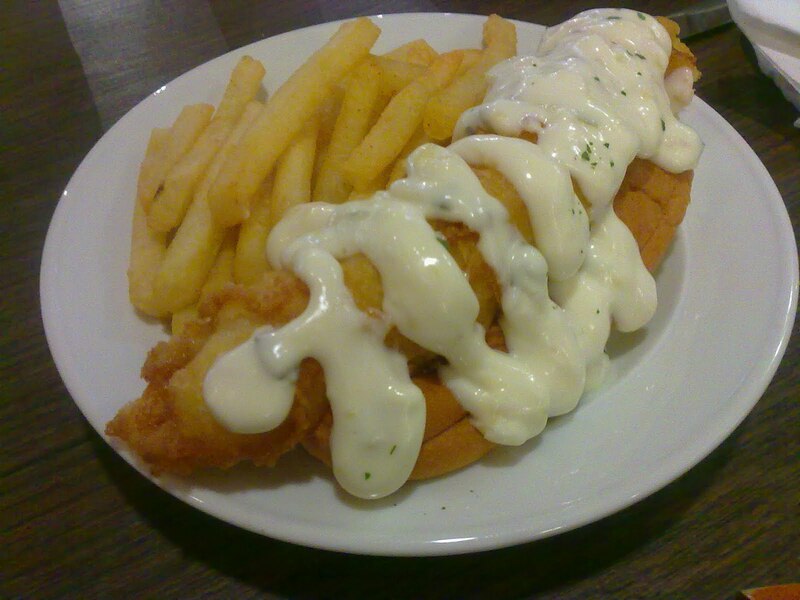 The combination of Hot-Dog-like bread and the ‘Fish-Dog’- a fusion with the typical hot dog bun and and ‘fish’ in the shape of a sausage. 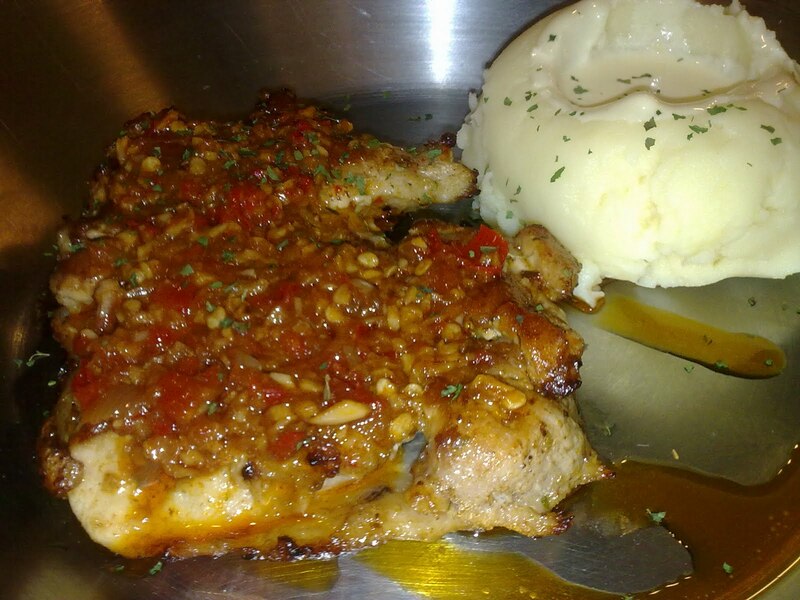 However, I was deceived by the look of the dish and the taste was really different from what I have thought of. The fish was tad spicy, with some paprika sprinkled in the fish. The hot-dog bun was really soft, it would be better if it is toasted slightly, retaining the softness of the bun inside and crispy on the outside. I was not really satisfied with the chicken, it was tough to tear them apart with a knife and the chicken meat inside does not have a flavor in it. I guess they would have to marinate the chicken longer as before and perhaps along with the Peri-Peri sauce to enhance the flavor of the chicken meat inside. Apart from that, the mashed potato at the other side of the pan fascinated me. The sauce that was contained in the mashed potato goes with it really well. Just wondering if the diners are supposed to mix both the sauce and the potato together? Well, I guess this is the normal burger that you have been eyeing on for lunch at fast-food restaurants. 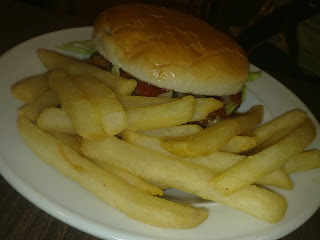 The burger doesn’t seemed appealing to me and personally, I would not want to try a typical Burger dish at Fish and Co. It would have been better if there’s a presence of thick, juicy sauce between the meat and the burger itself, and of course, more vegetables (my preference). 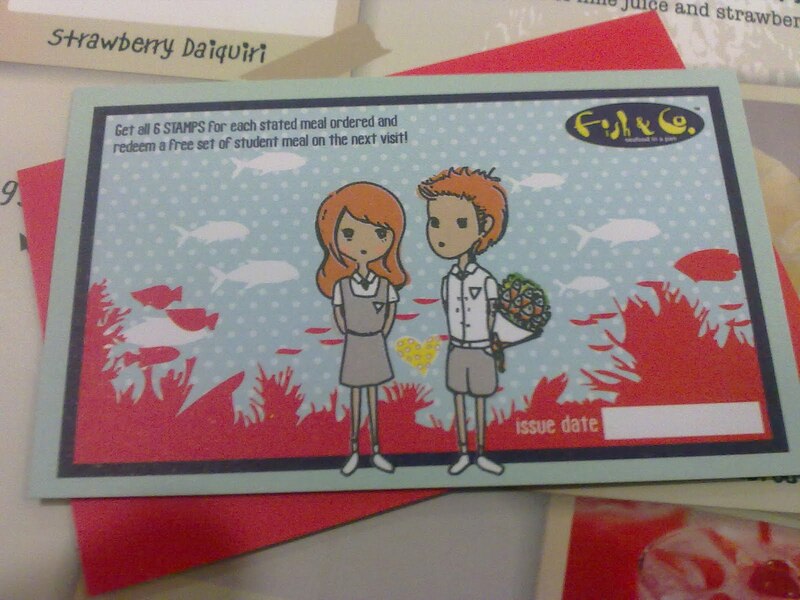 It has been really long since the last time I had dessert after my main course. 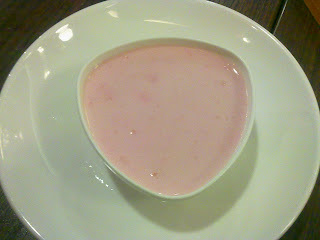 Don’t be deceived by the looks of the pudding although it was Strawberry flavor-ed. The rich, creamy Strawberry flavor of the pudding was savored by my taste buds. 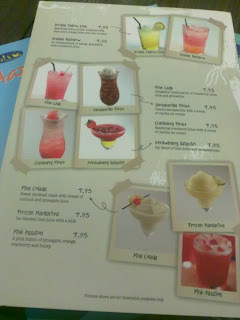 Last but not least, MOCKTAILS! 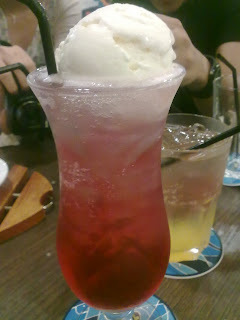 This was my first time trying out a Mocktail, and I have decided to pick on Cranberry Float. Well, I spotted Angie and Ben in action in the photo! This card was given to us too. 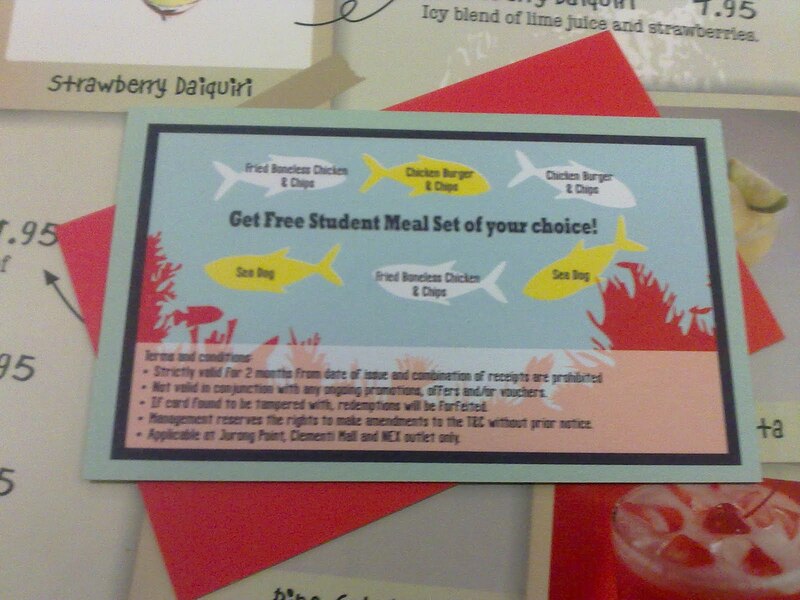 For every student fare meal you had, just present this card to get a stamp and collect all the stamps to get a free student fare meal of your OWN CHOICE. What are you waiting for? 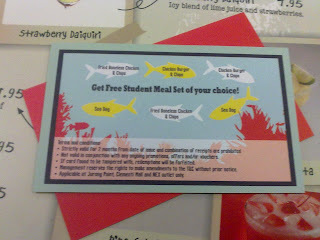 Hurry Down to Fish and Co and enjoy your Student Fare and Happy Lunching Meals! 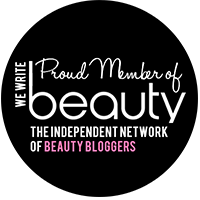 A big thank you to Sheena, who took great efforts to make this event successful and enjoyable for us. Also, not forgetting Nigel and Joey, without them, this event might not be a success and we would not have known about this event.